Nutrients-bombs ruby gems with earthy robust flavors & fragrance. Love the refreshing crunch with a soft chew, slightly juicy & sweet. Beets or beetroots are an ancient root vegetable – a health-boosting, immune-boosting nutrients goldmine. 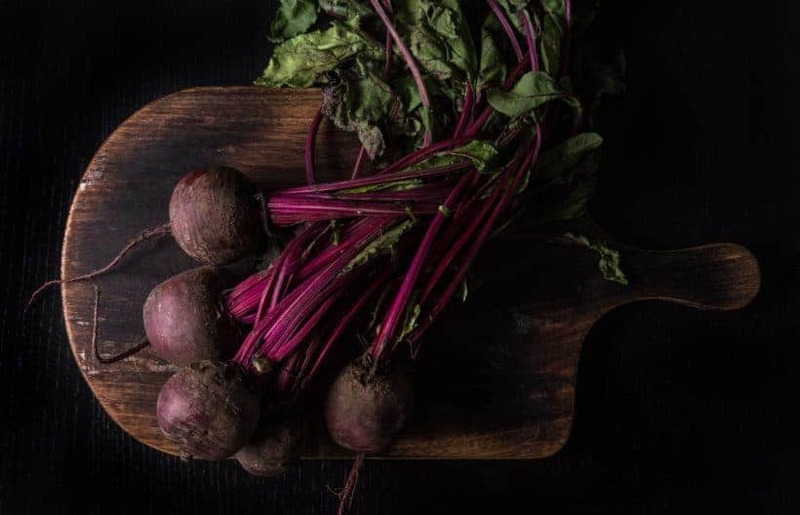 Some research found that beets may possibly lower blood pressure, drop risks of heart disease, boost endurance performance, help fight inflammation, prevent chronic diseases, and help purify your blood and liver. Even endurance athletes and bodybuilders try to incorporate beets into their regular diet. Beets are on the road to becoming a rock star, gaining the spotlight on the healthy food stage. It’s a nutrients powerhouse that improves your health: rich in antioxidants, essential vitamins, low in calories, high in iron, fiber, vitamin C, no cholesterol. Making beet puree or even smoothies! Beets vary widely in sizes. So, how long should we pressure cook them for? The best pressure cooking time highly depends on the thickness of the food item, so there’s no one-size-fits-all cooking time for these ruby health-boosting gems. 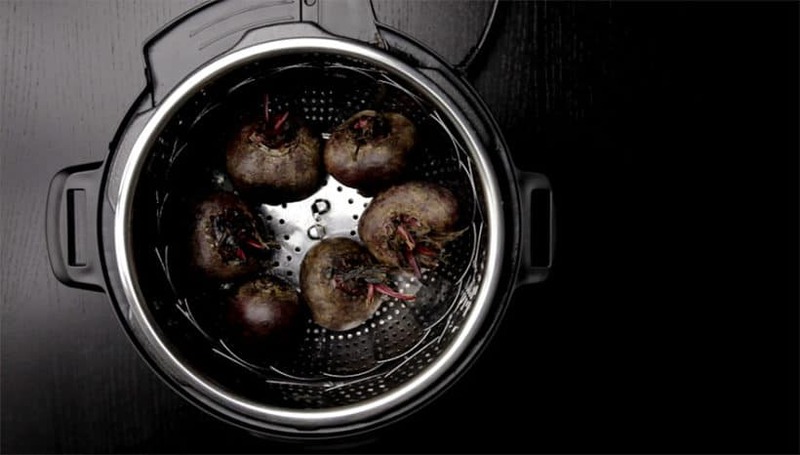 We conducted 9+ tests with various sizes of beets at different cooking times in our Instant Pot Electric Pressure Cooker. From the experiment results above, we’ve created a handy time chart for cooking Instant Pot Beets! Rub and wash the beets under cold running tap water. If your beets come with greens & stems, trim them off and save them for another dish (stir-frying with garlic tastes great). Trim off & discard the roots. 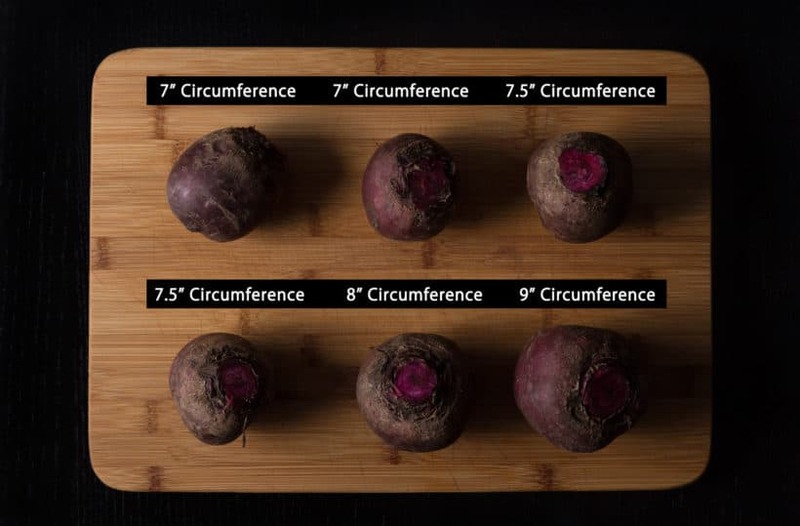 *Pro Tip: Measure your beets’ circumference with a measuring tape, and adjust your pressure cooking time accordingly using the time chart below. 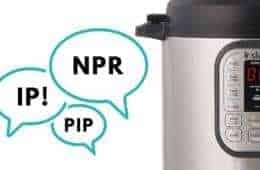 Pour 1 cup (250ml) cold tap water in the pressure cooker.Place a trivet or steamer basket in the Instant Pot, then place 6 medium beets (784g, 7.5” circumference) on the trivet. 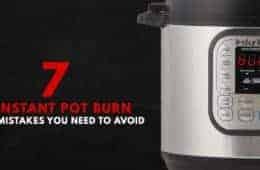 Close the lid and cook at High Pressure for 24 minutes (firm and a little crunchy) – 28 minutes (soft with some chew) + Quick Release (immediately release the pressure by turning the venting knob to venting position). The skins are edible. To peel or not to peel is of personal preference. Cut beets into quarters (you can wear disposable gloves to handle the beets if you don’t want beet-stained fingers). Season with salt if desired and serve hot or cold. 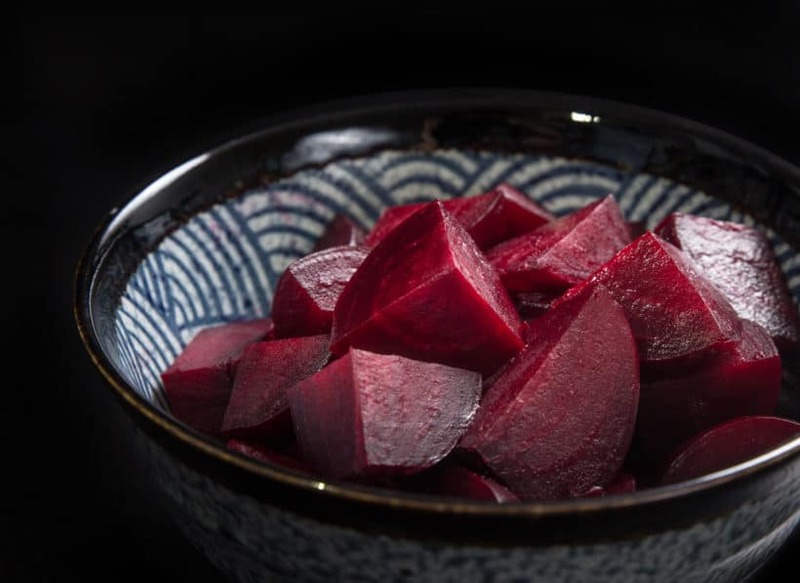 *Storage: Cooked Beets can be stored in refrigerator for up to 4 – 5 days. As mentioned above, the best pressure cooking time highly depends on the thickness of the beets, so choose beets roughly the same size to have evenly cooked beets! 2. How to Remove Beets Stains? We found that if we wash our hands, towels, or chopping board with tap water immediately after handling the beets, the red coloring washes off fairly easily. But when we let it sit too long, the blood-red stains can be a little scary on your fingers. 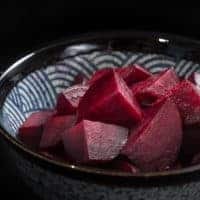 Super easy to make Instant Pot Beets Recipe (Pressure Cooker Beets) for salads, soups, pickled snacks, puree, smoothies. Includes tested cooking time chart. 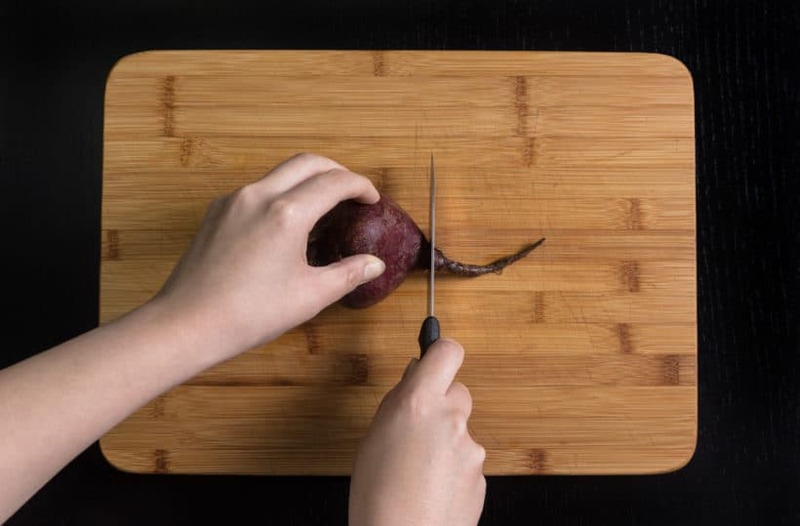 Prepare Beets: Rub and wash the beets under cold running tap water. If your beets come with greens & stems, trim them off and save them for another dish (stir-frying with garlic tastes great). Trim off & discard the roots. Pressure Cook Beets: Pour 1 cup (250ml) cold tap water in the pressure cooker. 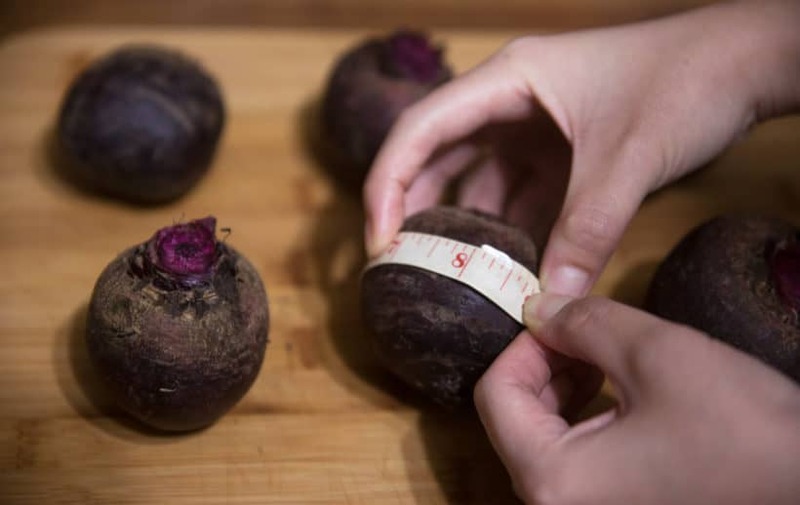 Place a trivet or steamer basket in the Instant Pot, then place 6 medium beets (784g, 7.5” circumference) on the trivet. Close the lid and cook at High Pressure for 24 minutes (firm and a little crunchy) - 28 minutes (soft with some chew) + Quick Release (immediately release the pressure by turning the venting knob to venting position). Carefully open the lid. 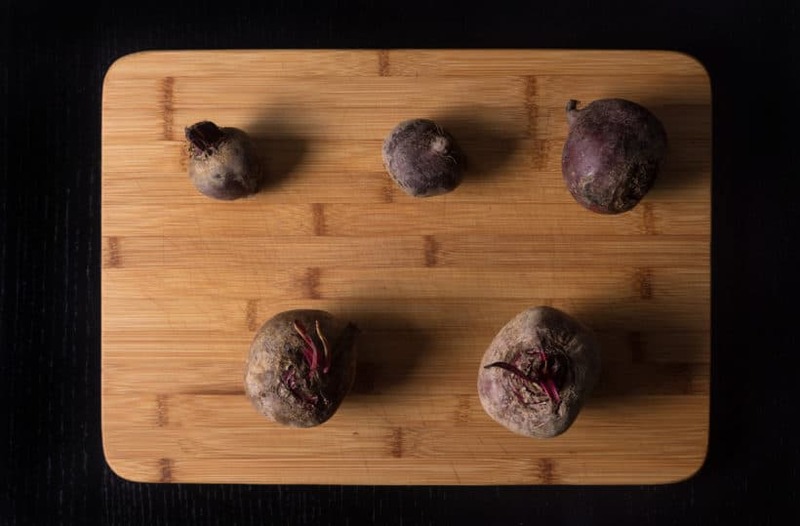 *Pro Tip 1: Adjust the cooking time according to your beets' size using the time chart below. Peel and Serve: The skins are edible. To peel or not to peel is of personal preference. Cut beets into quarters (you can wear disposable gloves to handle the beets if you don't want beet-stained fingers). Season with salt if desired and serve hot or cold. 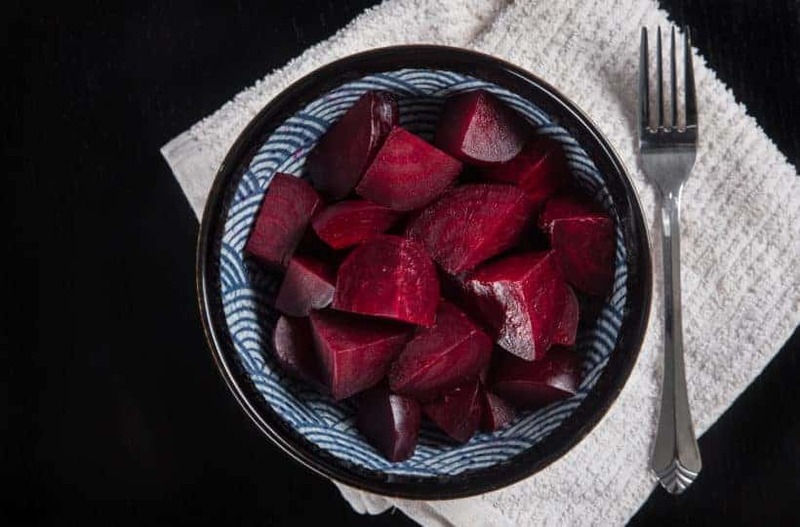 Storage Tip: Cooked Beets can be stored in refrigerator for up to 4 - 5 days. Wonderful…I’ve been using it for quite a while. My beetss\ always come out perfect. If I’m not able to do a quick release because I won’t be home–1) is it safe to not be home? 2) what happens if I let it naturally release? Thank you! 1) Once it has gotten up to pressure properly, it is just like any electronics. 2) The beets will be quite soft if the natural release is too long. I got a beet in my Misfits Market box (my very first box. It is 18 inches in circumference! Help! What is the time I should cook it in the Instapot? 64 minutes?? Thank you. I recommend cutting it in half and use the 9 inches cooking time. It will save some time! This is a great chart! They come out perfect every time. Thanks! Glad you enjoyed cooking beets in Instant Pot! One thing to add about Beets. They’re one of the best places to get Nitrates, which help build muscle. It’s a great supplement to any diet, particularly for people trying to build muscle. Thank you for the great summary of beet cooking times! I made one batch of beets: 7.5 inches and the times worked perfectly. However, when i followed the cook times for the 6.5 inch beets as a second batch they came out slightly undercooked adn the skins wouldn’t peel right off in the cold water and I had to put them in again. Maybe those smaller ones were woody and that is why i had trouble with that second batch? Regardless, it is still great recipe pin to keep in hand. I teach cooking classes and my students are often confused by vague measurements, i.e. 1 small onion, 3 medium beets, etc. Your measurements and instructions are fantastic! Thank you from the bottom of my heart! Thank you for passing your knowledge to the next generation! 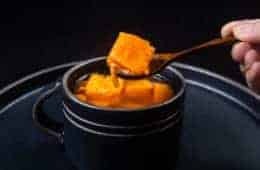 If you are using the pressure cooker at high altitude, does it matter how long the cooking time differs? After all it is in compressed chamber is it not? The cooking time will be different for High Altitude as Absolute pressure = Gauge pressure + atmospheric pressure. The atmospheric pressure is lower at higher altitude so the absolute pressure will also be lower at higher altitude. Please see this altitude chart for more info. Why cold water? I always use hot to speed things up. Hot water will decrease the get up to pressure time and you will have to increase the pressure cooking time to compensate for that. If you are following a recipe that starts with cold water, the result will be quite noticeable with delicate food such as eggs, seafood. Terrific. Thank you! I’ve been freezing the cooked beets (after removing air in a “Foodsaver”), and for the first time ever have beets on hand whenever we’re in the mood—which is often. Happy to see you are from BC as well! 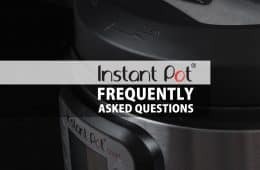 Hi Amy and Jacky, I am such a fan of your site after just purchasing a new Instant Pot 8qt Duo v2. This is the 2nd dish I made tonight as I had a 10 lb bag of beets and this is probably the quickest I’ve ever made cooked beets without heating up the stove or the oven… plus with the size of these beets, it would take hours to cook through (10 in diameter), so I did it for about 30-35 minutes. Who knew beets could be so easy to cook, peel and eat after cooling them slightly in cold water! Thanks for the time chart for the beets. I wondered if you could cook them with the skins on all the way. I know what I’m making for dinner now! Question: Do you know how long I would need to pressure cook beets just to remove the skins? Planning on canning some. Also, do you have a recipe you for making a beet pickle relish? Do you know how long I would need to pressure cook beets just to remove the skins? I would say 1 minute and then quick release. I don’t have a full blown recipe on hand, but this is the ingredients list of a recipe we have developed. It would be helpful to know what elevation you’re at. 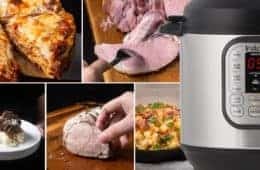 Can I half recepies and use 3 quart mini instant pot. How long would they heave to cook? Yes, it will work. The cooking time will be the same with 1 cup of water. Happy to hear the result Bethsy! 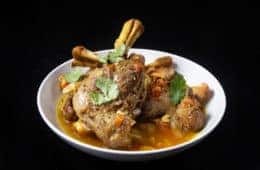 Thank you for the delicious recipes, cooking charts, and tips. Would it work to cook the beets for less time and let the pressure release naturally, instead of quick release? Is the release time based on the amount of liquid; or food, or both? Yes, it will work. The release time is based on both so it will be a little tricky to figure out the release time. Thanks for taking the time to test all your recipes so thoroughly and for all your tips to ensure our success with them! 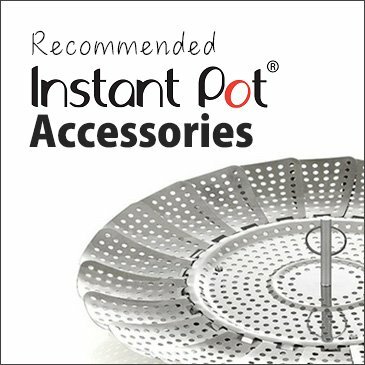 I wanted to ask, can I use my silicon steaming basket in the Instant Pot? It just fits and it’s easy to lift out with the handles. Silicone steaming basket will work, but you may want to increase the cooking time by 1 – 2 minutes. The beets came out perfectly and the skin came right off! I had never had fresh beets, only canned. What an amazing flavor and I made it! All of your recipes have been great, please keep them coming! Thanks for the cooking chart. You took away the challenge of what is a “small” or “large” beet! Thanks for taking time to do such thorough testing! I love golden beets and assume they have the same composition so cooking timing would be the same? It’s so nice to hear from you. Thank you for your kind words! In theory, they should cook the same. We haven’t done the testing on golden beets so I can’t say for sure! Please let us know if you do test it out. Leave a little of the stem & root on, and let them cool in a bowl of cold water. Slip the peels off while they are under water and, voila, no stained fingers. It will be helpful to all of us!